Interesting blog post. I was ready to order the Trifield on amazon, but this changed my mind. I guess without a way to calibrate the meter, it’s of no use. Thank you for your feedback on my EMF meter article! 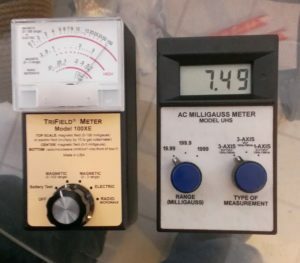 It is a shame that consumers often wind up taking the cheap route on a magnetic AC field meter that is not suitable for professional EMF surveys and then wind up passing up a good deal on a home or property that is suitable, but is misjudged otherwise by inaccuracy and / or misinterpretation of the results. It boggles me that people will balk at spending an extra $200 to purchase a better meter or getting an experienced pro, but then in turn wind up losing $1000s by wasting time looking for another property that may not be as affordable and desirable as the original real estate of interest. While I appreciate that your comment succinctly underscores the potential complexity between environmental factors such as mold / mycotoxicity exposure and the potential and /or alleged influence of bioelectromagnetic effects from EMF fields, the nature of your questions are sufficiently numerous and complex that this would warrant a full consultation as I would have to hear more details to comment with any authority. > Is there a meter that a consumer can use to accurately test their home? Certainly there are accurate electromagnetic meters that cover a variety of fields including EMF and RF of different frequencies, but the real issue is properly interpreting the readings and that requires a high degree of experience, education and putting the findings into a reasonable context. High compared to what? That can be quite relative and there are no agreed upon standards just as there are no specific EPA or federal standards for mold spore levels due to variances in individual sensitivity. In general, the only options are avoidance, electrical repair, current reduction, shielding and active EMF cancellation with the final two ranging in cost from expensive to astronomical. > I read that there was a device that you can buy that converts all the emf’s to a safe frequency, but do they work? I have yet to see any of those devices work to my satisfaction – and who judges what is a “safe” frequency? Unless you are dealing with high energy RF / radar / microwaves or ionizing radiation, there are no designated unsafe frequencies. adding to Might Ms Bradford be referring to the dirty electricity options that plug in to to the sockets.. Stetzerizer type? would love to know your thoughts it they are work it or not. >adding to Might Ms Bradford be referring to the dirty electricity options that plug in to to >the sockets.. Stetzerizer type? would love to know your thoughts it they are work it or not. If you re-read my response to Ms. Bradford, the final few paragraphs sum up my assessment of how to deal with EMF fields and the devices you mentioned do not change the nature of my answer. I am trying to learn but the jargon used is so above me my brain overloads…..i want to buy a good meter to check my smart meter since it is directly behind where I lay my head. But now I don’t think I can properly read the results since I am not a professional. Ugh!!! >I am trying to learn but the jargon used is so above me my brain overloads…..i want to buy a good meter >to check my smart meter since it is directly behind where I lay my head. But now I don’t think I can >properly read the results since I am not a professional. Ugh!!! I can appreciate your sentiment and this is why professional EMF consultants exist – not only to select the correct equipment, measure and record the results, but to be able to put them into a meaningful context. We can’t all be experts at everything and I am no exception. Sometimes I need to consult professionals in areas that I don’t have the education, experience or tools to do a justice to the task at hand. Some people think you can become an Internet guru on anything in a few hours and that is just not realistic for a lot of scenarios. In many cases, the best you can do is EVALUATE who is the best person or resource to approach for assistance. This IS the wrong meter. Should be using the TF2 digital version. The old 100XE is frequency weighted unless it is one of the specialized “flat” versions, the AC milligauss meter is not frequency weighted. Of course they don’t read the same. The TF2 has both weighted and standard modes; so comparisons to scientific standards are pretty simple. FYI, Alphalab Inc makes all 3 meters. The 100Xe, the AC milligauss meter you compared it to, and the newer TF2. In this article, I don’t think you showed a fault in the meter(s), you showed you don’t know how to interpret the frequency weighted results on the 100XE. Fortunately, the new digital TF2 makes this easy for you by providing the flat and weighted modes on the same device. A few remarks about your comment. >This IS the wrong meter. Should be using the TF2 digital version. The TF2 only came this year in early 2018. Did you happen to notice that this post dates back to August 2013 which is five years ago? >The old 100XE is frequency weighted unless it is one of the specialized “flat” versions, the AC milligauss >meter is not frequency weighted. Of course they don’t read the same. Rarely are any two meters (even the same model) going to read EXACTLY the same, but the point of the article is that for a while, the production run of 100XEs were wildly inaccurate to the point of being worse than useless, and that had nothing to do with the frequency weighting – it was the calibration and / or poor linearity that proved unacceptable for any kind of reliable survey or evaluation. >The TF2 has both weighted and standard modes; so comparisons to scientific standards are pretty >simple. FYI, Alphalab Inc makes all 3 meters. 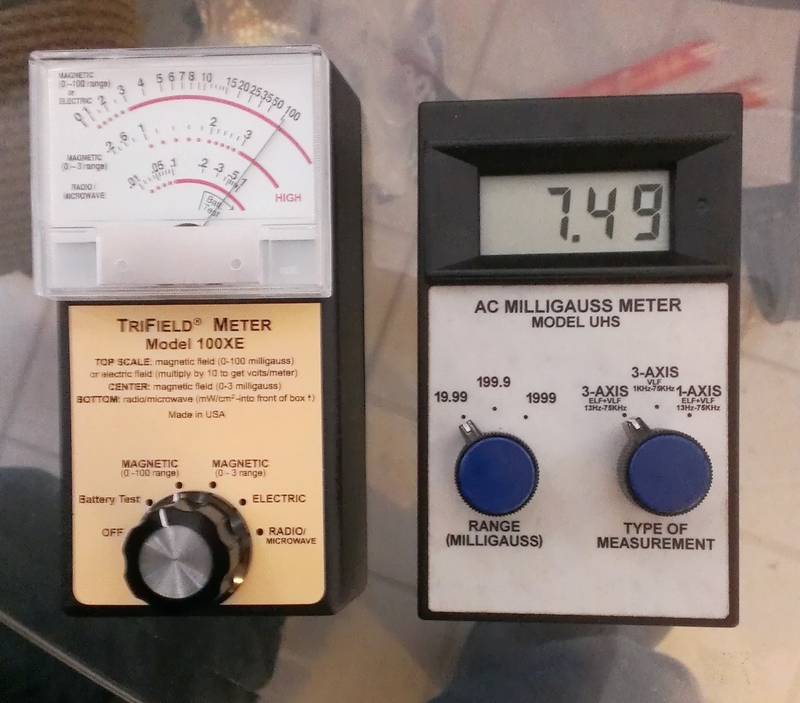 The 100Xe, the AC milligauss meter you compared it >to, and the newer TF2. 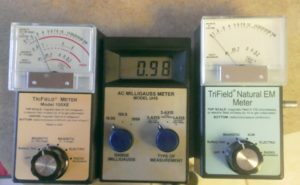 I have been buying AlphaLab equipment for over 16 years (including the TF2 recently) and I am very well aware of their complete product line and the capabilities of these meters since I own several including some from other manufacturers. BTW, the 100XEs are no longer in production anyway. I did demonstrate a fault in the meters, particularly the first one where the 100XE read nearly 100 mG vs. the UHS version which showed 7.49 mG. That is more than an order of magnitude off or over 13 times greater than a True RMS reference AC gaussmeter. For a frequency weighting skew of THAT magnitude which you are implying in your statement, the frequency being measured would have to be over 480 Hz which is the 8th harmonic of the standard US power mains frequency of 60 Hz. And I can tell you with incredible certainty that a magnetic field of that frequency with enough magnitude to give a reading that high did NOT exist at the time of measurement. For one, harmonics almost invariably decrease rapidly in amplitude the higher in order you go and by the 8th harmonic, the field would be a fraction of the original at 60 Hz. Also, it is highly unusual to find a 100 mG field at that frequency unless you are very close (within an inch or so) to a transformer or energized motor winding as magnetic fields are very concentrated in such configurations. >you showed you don’t know how to interpret the frequency weighted results on the 100XE. I’ve been in electronics since I was a teenager, worked as a Certified Radio & Instrumentation technician for 10 years, have a dual degree in Electronic Telecommunications as well as a Bachelor’s of Science in Electrical Engineering (B.S.E.E.) in addition to doing THOUSANDS of EMF surveys since 2002 and I can assure you that I know exactly what the hell I am doing. You on the other hand don’t seem to know how to read a simple timestamp date on a post, let alone give valid feedback about my professional practices or commentary. However, I appreciate your post because it well contrasts the thinking of a well meaning but misinformed enthusiast vs. a seasoned professional.